Too much of a good thing, in the flesh. Sometimes too much of a good thing can be too much. 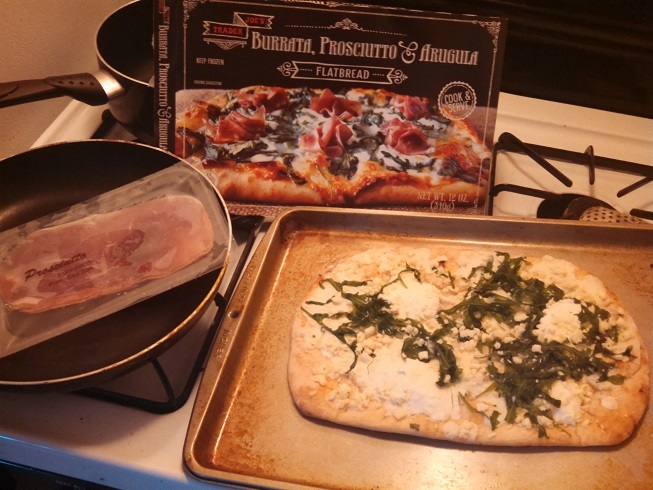 Trader Joe’s Burrata, Proscuitto and Arugula Flatbread pizza is an exercise is decadent excess – not dissimilar to their Cookie Butter Cheesecake, or Caligula’s Rome. And like those forebearers, this flatbread tantalizes more than it delivers. On paper this flatbread sounds like it should be about the best thing ever – a hand-stretched, brick oven-fired crust, topped with mozzarella, fontal, Pecorino Romano, Parmigiano Reggiano, and burrata cheeses, atop a spread of mascarpone garlic cream sauce, topped with wild baby arugula and marbled slices of prosciutto. 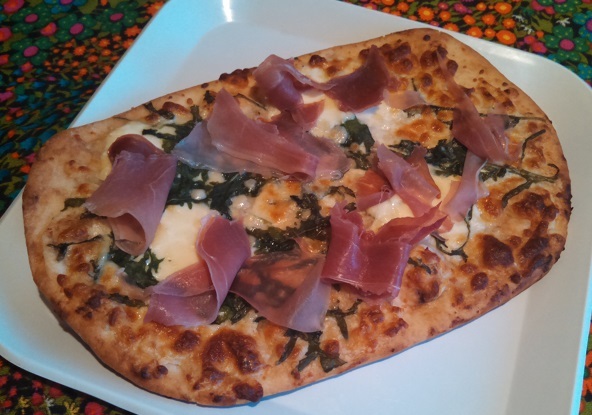 The flatbread comes as a simple kit, ready to be warmed to a crispy golden hue in your own oven, then topped with two broad slices of prosciutto. It sounds perfect, basically. Unfortunately, all this goodness run into the classic “more isn’t always more” quandary. I usually encounter this in terms of drinking. One drink, and I feel good. Two drinks, and I feel a little better. Three drinks, and hey this is really getting fun! Four drinks, however, and things take a rather unpleasant turn. Trader Joe’s is essentially taking the four drink approach to salty food with this flatbread. Those are some good cheeses, and good cheese sauce, and good prosciutto, but when you put them all together you end up with a flatbread that’s too overwhelming to really bite into. However, that’s not to say this is a bad flatbread. There’s nothing wrong with the individual components – all of which are very tasty and decadent indeed. The problem comes when you try and eat it like an entree. 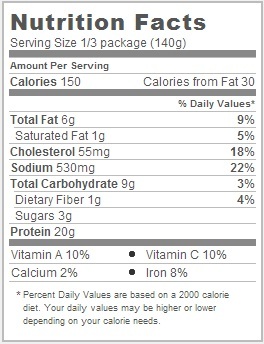 The servings per container given on the package is 3 slices. I would suggest changing that to 30. Sliced up into a few big bites, this flatbread is simply too rich with fat and salt to really savor – even if you’ve got a good beer at hand. However, cut it up into smaller, hors d’oeuvre sized bites and you’ve got an instant party classic. When you’ve sized it down to nibbling size, the tongue is given a chance to experience the richness of the soft white cheeses, the supremely savory prosciutto, and the spicy arugula. Just as the cure for Trader Joe’s Cookie Butter Cheesecake was Cookie Butter Cheesecake Bites, this sumptuous pizza is better served by smaller servings. Would I Recommend It: I would, just not very much of it. 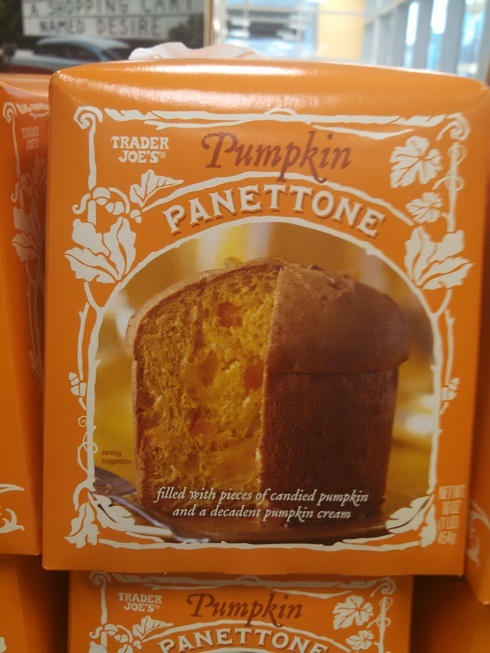 Would I Buy It Again: I’d bring it to a potluck. Final Synopsis: An overwhelmingly rich flatbread. Look, I know quinoa is enjoying something of a heyday, the likes of which has been unprecedented since the ancient grain was originally introduced as a staple of the human diet in 5,000 BC, but there are certain applications of it which are bound to make even the hippest vegetarian blink. I’ve calmly accepted quinoa in my salads, my “chicken”, and even in my sushi. But quinoa in my pesto? That’s a development that begs further inquiry. Quinoa was originally cultivated in the Andes region of South America since the rise of civilization there. However, since it’s uptake by the incessant marketing machine in the mid 2000’s, quinoa has been trumpeted as a superfood for it’s many healthsome properties – some certified, some merely alleged – and introduced into practically any food product in need of a sales boost. What is absolutely true is that quinoa is a gluten-free grain, and is relatively protein rich. Given that both these qualities dovetail nicely into the culinary trends of the day, its recent, widespread popularity should probably not be a surprise. It is notable however. Since 2006, the price of quinoa has tripled on the market even as crop production has nearly doubled world wide – and in 2013 no lesser body than the United Nations itself declared it the “International Year of Quinoa”. They had a logo and everything. While the sudden rise of quinoa from obscurity to mainstay may sound unusual, it’s not alone. In fact pesto – yes the very pesto in this quinoa and pesto sauce – shares a very similar original story. Pesto may not have a pedigree that stretches back thousands of years, like quinoa, but it’s a lot older than you might think. The first bowl of pesto was found on the table of the ancient Romans who ate a paste of crushed herbs, garlic and cheese. As they conquested into northern Italy/southern France, the basil that grew there was introduced into the dish – resulting in the pesto we know and love today. And then nothing happened for two thousand years. Despite the fact that pesto took it’s fully mature form sometime before the birth of Christ, it was largely unknown out of the rustic Mediterranean regions where it sprang into existence. Not until 1863 is the first recipe for pesto recorded, and it is not until nearly a hundred years after that, in 1946, that the first pesto recipe shows up in America. Even then, pesto continued to languish in relative obscurity until the 1980’s, when it started to be adopted into Italian cuisine on a wide scale. So why combine these two long overlooked food items into one condiment? 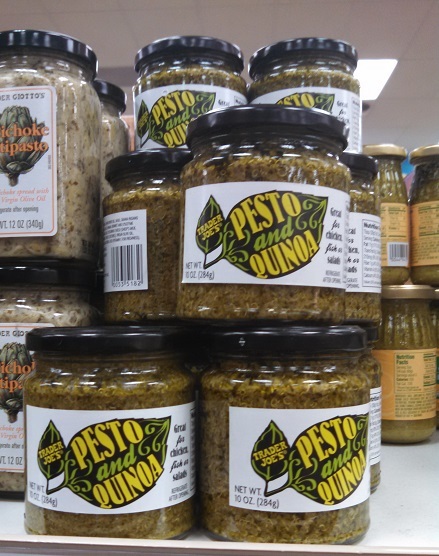 Why did Trader Joe’s bother to make Pesto and Quinoa? When you try it, the first thing you’ll notice is that they might as well have called it pesto with quinoa, instead of pesto and quinoa. The point being that this is a pesto sauce, first and foremost, with the quinoa making a very meager impact on the overall dish. Apart from the quinoa, this is a standad pesto recipe – filled with plenty of basil, oil and grated cheese. What it doesn’t have, however, is any pine nuts. In place of that crunchy nuttiness you get the squishy nuttiness of lots and lots of quinoa. This makes the pesto taste more or less like any other pesto you’ve had from a grocery store, even if it looks very very different. There’s so much quinoa in this pesto that it’s far and away the first ingredient. When you unscrew the lid you’ll see a load of quinoa, sprouts and all, staring back at you. If you can get over the somewhat unsettlingly different appreance, you’ll find that this pesto works just like the regular stuff – you can add it easily to pasta, chicken, fish or salads for that big sloppy kiss of savory basil. Just don’t expect it to spread quite like regular pesto. The quinoa makes it much lumpier than a normal pesto, and requires a little extra finesse on the part of the eater. 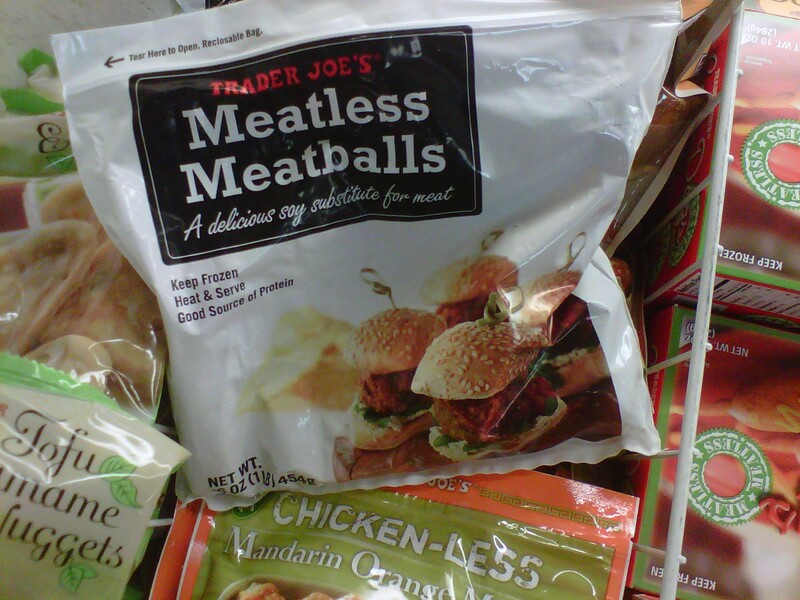 While that’s all well and good, it does make you wonder why Trader Joe’s bothered to make this stuff at all. 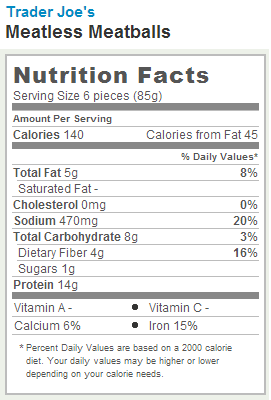 There isn’t any real difference in the calorie or fat content between this and ordinary pesto. While I enjoyed it on a variety of meals, I didn’t enjoy it any more than I would have any other pesto. And with the slightly unappealing look and unweildly nature of the quinoa, there really isn’t any need to get it again. I’m glad TJ’s discovered a tasty Peruvian pesto, I’m just not so sure why they wanted to pas it along to all of us. Would I Recommend It: No, I don’t think so. Would I Buy It Again: Nope, no need. Final Synopsis: Pesto with a bunch of quinoa in it tastes just like pesto without quinoa in it. So why bother? Behold Trader Joe’s Grilled Chicken Cacciatore in all it’s mediocrity! 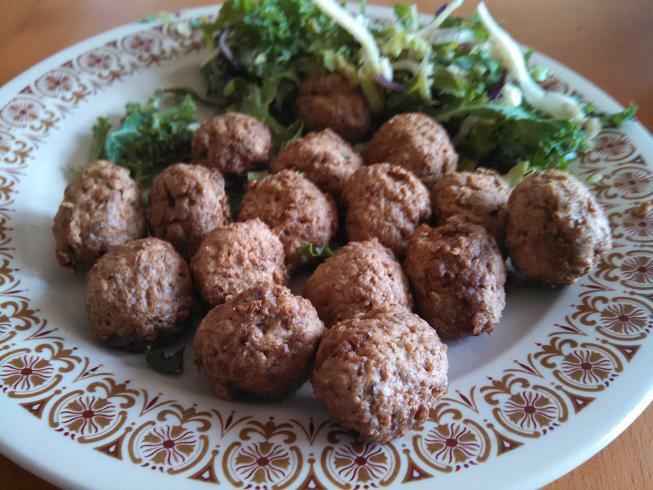 I have to say, I’m let down by this dish. 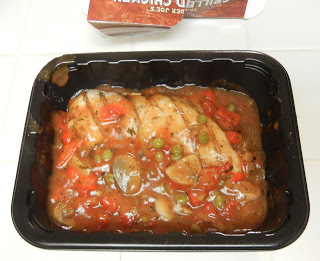 When I picked up Trader Joe’s Grilled Chicken Cacciatore I was intrigued – it looked good in that picture on the label, all nicely grilled and swimming in a simmering red sauce. The name had a nice ring to it too – cacciatore. It sounds like the ultimate, all purpose Italian word, as if somewhere on the coast between Naples and Florence sits a small town where, even now, a plump matriarchs hang out their windows shouting “Cacciatore!” at the children who run off through the cobbled streets with their soccer balls, laughing “Cacciatore, cacciatore” over and over as they burst past the local pizzeria. “Cacciatore!” shouts the friendly, mustachioed, dough twirling baker. In actual point of fact, “cacciatore” translates as “hunter”. The connection, allegedly, owes to the fact that it was originally a dish cooked for hunters who returned home without catching any game thus forcing the wife to resort to a chicken stew cooked with the mushrooms he had collected while out in the forest. This origin story is so tortured and improbable that, in light of the insane word histories of linguistics, it is probably true and, moreover, makes a good case for just giving up on language all together. 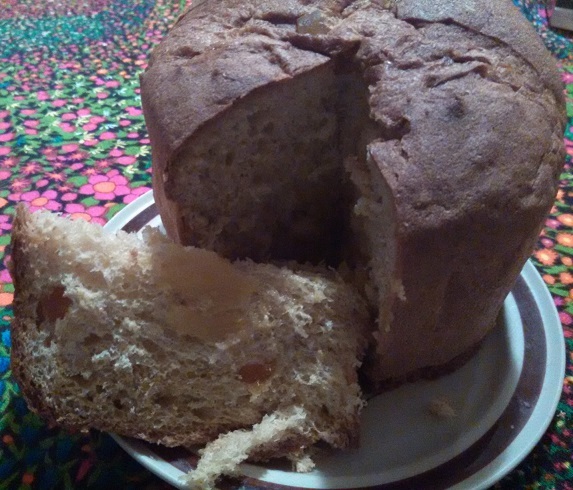 Romantic notions and etymology aside, I’m a big fan of Italian food – or of any cuisine that makes liberal use of bubbling cheese and fresh baked bread – and was truly excited that Trader Joe’s was offering up a quick-to-prep and very cheap slice of the Italian culinary world. After all, what’s not to like about grilled chicken in a hearty sauce? Well, in this case, quite a lot. The cacciatore’s greatest failing, like the acting of Tobey Maguire or McDonald’s, is its mediocrity. The chicken, despite actually appearing to be grilled, is completely unexceptional, while the sauce it’s served in simply tastes so-so. There seems to be an attempt to make up for the generic sauce by providing a huge quantity of it – enough to totally drown your plate in certainly. This tactic fails to salvage the dish. This is a far cry from the hard won excellence of the equally Italian Minestrone – and when it comes to your hard scrabble dinning dollars, there’s nothing to recommend it over the far superior dishes of steamed Hake, stuffed red peppers or even the quinoa and squash salad. A final note on the preparation. TJ’s suggests two different methods for cooking up your cacciatore – either a quick stint in the microwave, or 25 minutes spent boiling the plastic bag on your stove top. Out of sheer American optimism I decided there must be some hidden merit to the bag-boiling method and undertook it. Rest assured that there is not. Woudl I Buy It Again: No sir. Final Synopsis: A plastic-wrapped piece of mediocre chicken in a sea of unexceptional sauce.